The Waddington Medal is the only national award in Developmental Biology. It honours outstanding research performance as well as services to the subject community. The medal is awarded annually at the BSDB Spring Meeting, where the recipient presents the Waddington Medal Lecture. Here we introduce the 2018 winner Richard Gardner who won the 2018 Waddington medal for his outstanding work in the field of early embryogenesis and stem cells, as well as continued contributions to the development of our field and the shaping of science policy in the UK. Born in 1943, Richard Lavenham Gardner, Kt, MA, PhD, ScD, FIAT(Hon), FRSB, FRS studied at St. Catharine’s College and the University of Cambridge from 1963-1966, graduating with a First Class Honours B.A. in Physiology. For his PhD, he remained in Cambridge in the Physiological Laboratory of Robert Edwards (Nobel prize winner, pioneer in reproductive medicine and in vitro fertilisation/IVF), where he worked alongside Martin Johnson and was awarded his title in 1971 for his thesis entitled “Investigation of the mammalian blastocyst by microsurgery”. He stayed on in Edward’s lab as a research assistant for another three years, from where he moved to a University Lecturer position at the Department of Zoology, University of Oxford (1973-77). During that time (and beyond) he was a Visiting World Health Organization Fellow in Warsaw and Zagreb and Student of Christ Church (Oxford). In 1978 he became Henry Dale Research Professor of the Royal Society at the University of Oxford until 2003. Thereafter he held position as Edward Penley Abraham Research Professor of the Royal Society (2003-8), honorary Visiting Professor at the University of York (2007-16), and is now an Associate at the University of Oxford and Emeritus Student of Christ Church, Oxford. 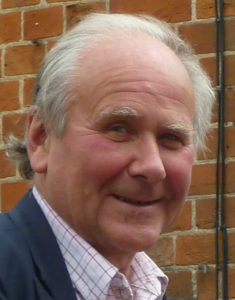 Scientifically, Richard is well known as a pioneer in the study of early mammalian development, having made many hugely important discoveries relating to the fate of cells in early mammalian development and the properties of stem cells derived from early embryos (see selected papers below). These were made possible by his strong knack for identifying important questions and addressing them in innovative and at the same time definitive ways, always with extremely elegant experimental design. His numerous important scientific contributions include: being the first to use clonal analysis to fate map the early mouse embryo, along with experimental manipulations to assess the potency of individual cells, establishing how the germ line is segregated in the early embryo, and pioneering blastocyst injection for studying stem cell potency. His work laid essential foundations for preimplantation genetic diagnosis, now widely used in human fertility clinics, and for the embryonic stem cell (ESC) field. He was one of the pioneers developing and using micromanipulation techniques in mammalian embryos, the kind of technique now commonly used, for example for human IVF and cloning (such as the cloning of the sheep Dolly). He is also known for his work on embryonic stem cell derivation (together with Frances Brook), demonstrating that ESCs originate from the epiblast and that the most efficient method to derive them in mouse is to use delayed-implanting blastocysts (diapause blastocyst). 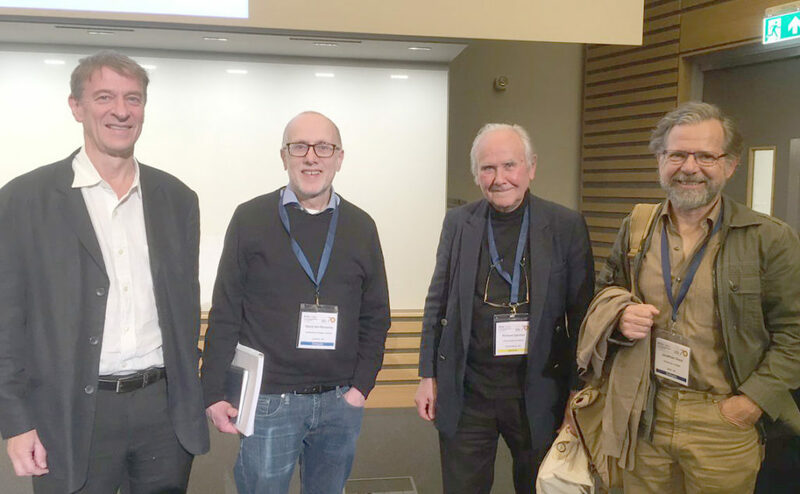 The four surviving ICRF Developmental Biology Unit group leaders – Philip Ingham, David Ish Horowicz, Richard Gardner and Jonathan Slack at the BSDB Spring Meeting 2018. Organiser of various scientific conferences, meetings or discussion forums. Richard’s enormous influence is also reflected in the fact that he was mentor to many illustrious embryologists, including Janet Rossant (PhD, 1976), Andrew Copp (DPhil, 1978), John Heath (DPhil, 1979), Paul Tesar (DPhil, 2007), Virginia E. Papaioannou (postdoc, 1973-81), Jenny Nichols (PhD, 1990), Karen Downs (1989-93) and the recipient of the 1999 Waddington medal Rosa Beddington (D. Phil., 1983) – to name but a few. But it should also be pointed out that aside all this prolific work in science as well as science administration and policy, Richard still has been finding time for an impressive number of hobbies, of which he lists ornithology, music, sailing (unfortunately no longer! ), gardening, clay shooting and painting landscapes in watercolour. To illustrate Richard’s continued dedication, he donated his latest three watercolour paintings to the AS-ET and they were sold for a gratifying £1150 to provide bursaries and other awards to enable laboratory animal technicians to advance their education and training. The BSDB would like to congratulate Richard Gardner for the Waddington award, of which he certainly is a most worthy recipient. Gardner, RL (1968) Mouse chimeras obtained by the injection of cells into the blastocyst. Nature 220: 596-7 — This paper describes the method of blastocyst injection in which small groups of donor cells derived from a genetically-distinct blastocyst are injected into the blastocoel cavity of a host blastocyst; chimeric blastocysts are then transferred to a foster mother and gestated to term. The paper also demonstrates that blastocyst cells contribute to the adult animal and germ line. The technique of blastocyst injection is still used routinely both to generate transgenic mouse models using genetically-modified embryonic stem cells. Gardner RL, Lyon MF (1971) X chromosome inactivation studied by injection of a single cell into the mouse blastocyst. Nature 231: 385-6 — Using blastocyst injection of single inner cell mass (ICM) cells combined with genetic markers, this paper shows that the adult animal is derived from the ICM. It is also a landmark paper in the history of the discovery of X-inactivation. Gardner RL, Papaioannou VE, Barton SC. (1973) Origin of the ectoplacental cone and secondary giant cells in mouse blastocysts reconstituted from isolated trophoblast and inner cell mass. J Embryol Exp Morphol. 30: 561-72 — In contrast to “blastocyst injection” (above) to determine the fate/potency of ICM cells via injection into the blastocoel cavity, the technique of “blastocyst reconstitution” was created to discover the fate and potency of the trophectoderm. The paper demonstrates that the trophectoderm gives rise to major components of the chorionic component of the placenta but not to the embryo proper. This allowed him to create the first fate maps of the mouse conceptus. Gardner, RL (1982) Investigation of cell lineage and differentiation in the extraembryonic endoderm of the mouse embryo. J Embryol Exp Morphol. 68: 175-98 — At implantation, the ICM segregates into epiblast and primitive endoderm (PE). Using blastocyst injection, this paper shows that PE generates visceral and parietal endoderm, which are supporting tissues for the ICM-derived epiblast. This study expanded the mouse fate map to show that ICM gives rise to epiblast and primitive endoderm. Gardner RL, Meredith MR, Altman DG. (1992) Is the anterior-posterior axis of the fetus specified before implantation in the mouse? J Exp Zool. 264: 437-43 — This paper provides the first evidence that head-tail orientation of the early embryo is established prior to the overt appearance of the primitive streak. Acknowledgements: Andreas Prokop would like to thank Berenika Plusa for helpful information, Richard Gardner for sending information, images and approving the draft of this article, and Claudio Stern and Jonathan Slack for helpful information and thoughts taken from their nomination text.